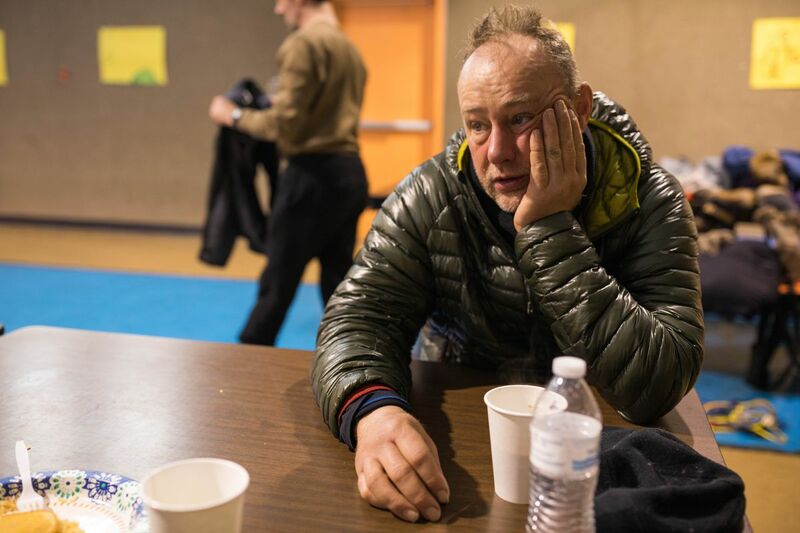 NIKOLAI — Iditarod musher Rob Cooke is sick. Cooke sat in the school cafeteria here Wednesday morning, his back against the wall, a water bottle in one hand and a cup of coffee in the other. "I've got a really bad stomach bug and extremely bad diarrhea at the moment, but I'm hoping that flushing everything out of the system will do it," said the 51-year-old musher who lives in Whitehorse, Yukon. This is Cooke's third Iditarod Trail Sled Dog Race. He said he started feeling sick Tuesday night while camping between the checkpoints of Rohn and Nikolai with his 16 dogs. "Dogs ate well. I ate well, I think," Cooke said. "I got some sleep and then as soon as I woke up I knew that something was wrong." He threw up seven or eight times on his way to Nikolai, at mile 263 of the 1,000-mile race, and became worried about losing too much fluid. Temperatures pushed into the low 30s — warm for a sled dog race. "These temperatures are too warm," he said. He said he's not sure what led to his stomach illness. Maybe, he speculated, it had to do with dirty hands. "Handling thawing meat, maybe feeding myself, doing chores, maybe that's not good," he said. Cooke sat at a crossroads around 9:30 a.m. Wednesday. He said he had to decide whether to keep resting, push through or quit the race.